The Domebo Site Mammoth kill site (34CD50) is located in Caddo County, Oklahoma. The site was excavated in the early 1960s and published in the Contributions of the Museum of the Great Plains by F. C. Leonhardy. 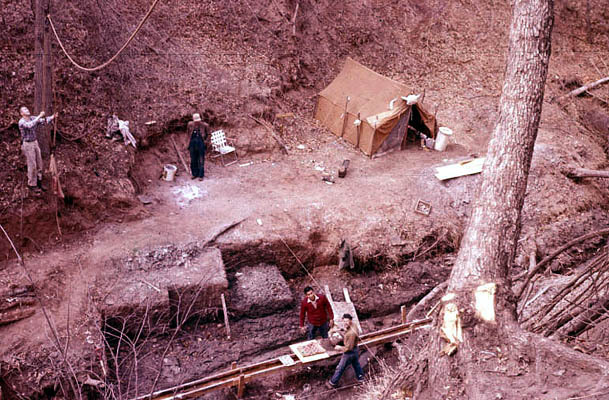 Kodachrome and Ektachrome slides were taken of the excavation by Dr. Hoover of Springfield, MO. He gave the slides to Michael Fuller in the 1970s and they were digitized by the Instructional Resources Office of St. Louis Community College. The Ektrachome slides had shifted red but have been corrected with Photoshop. The date on the slides is March 1962. 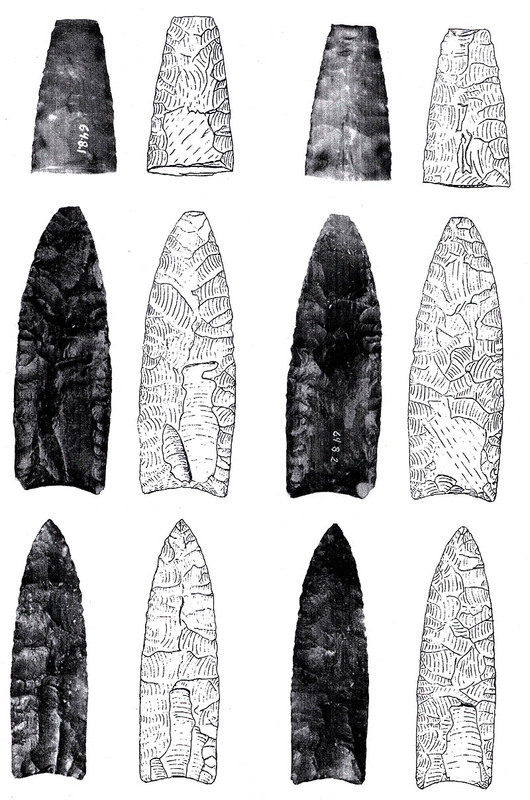 Line drawings of Clovis Points and scrapers from the Domebo site were kindly provided by the Museum of the Great Plains in Lawton, OK.
Steps cut in the banks of the creek to reach the bone bed at the Domebo site. Archaeologists with their field tent at the Domebo Site. 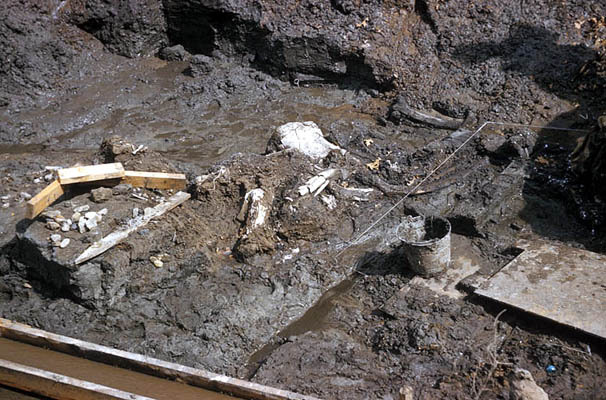 Mammoth bones emerging from the muddy pond sediments at Domebo. The geographic situation of this site bears some parallel with the Kimmswick Site in eastern Missouri. Closeup of bones during excavation at the Domebo Site. 3 Clovis Projectile Points from the Domebo Site. TOP) Broken midsection, approximately 4.2 x 2.3 cm. 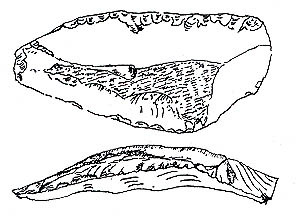 (from a published drawing); MIDDLE) Clovis missing the very tip, approximately 7.6 x 2.5 cm. 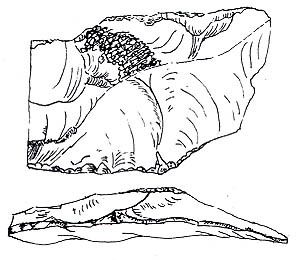 (from a published drawing); BOTTOM) intact Clovis, approximately 7.0 x 2.1 cm. (from a published drawing). 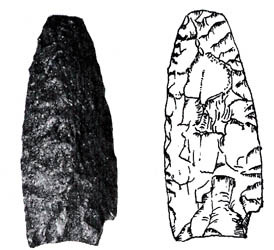 A Clovis Projectile Point from the Domebo locality. Measuring approximately 5.7 x 2.5 cm. (from a published drawing). Scraper on a blade from the Domebo locality. Measuring approximately 6.7 x 3.1 x 1.2 cm. (from a published drawing). Utilized flake tool from the Domebo locality. Measuring approximately 7.1x 4.2 x 1.2 cm. (from a published drawing). 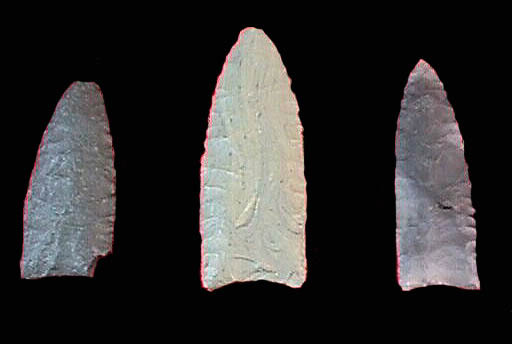 3 Clovis Projectile Points from the Domebo locality. 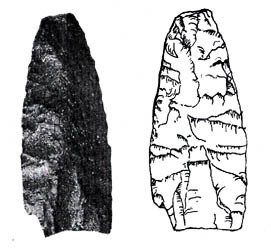 Clovis points and 2 scrapers from the Domebo locality. 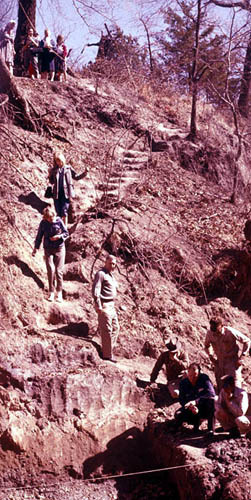 Environment along the canyon was wooded as evident by the cottonwood and elm stumps found in the area. 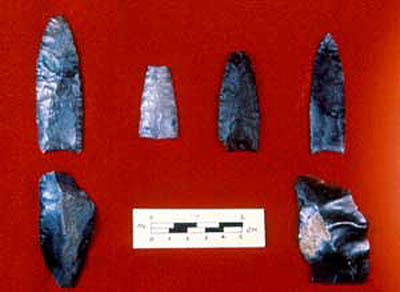 Clovis, plainview and other paleo points are found along the creeks with similar waterlogged stumps. The trees were not destroyed by a catastrophic event because bark still adheres. It was some kind of an erosional, flood-like episode. Radiocarbon dates from the site include: 8,090 BC +/- 250 AMS date, 8,173 BC carbon dioxide date above bones, 9,095 BC carbon dioxide date on stump near bones, 9,270 BC carbon dioxide date on bones, and 9,250 BC carbon dioxide date on bones. The AMS radiocarbon date uses more advanced C-14 measuring procedures and may be more accurate than the earlier, carbon dioxide process dates.